Things are going much better now. We had a teaching appointment last night with a girl who really wanted to learn about our church. 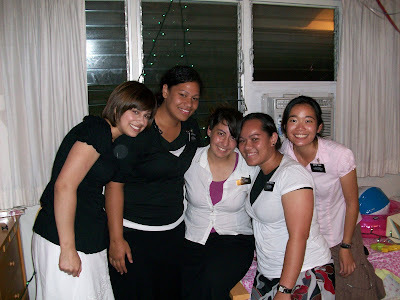 She had a lot of Mormon friends growing up and went to church a couple times, but never had the chance to get more involved. She's 21 now and really wants to become a part of our church. Hopefully she can continue to see the benefits that come from the gospel so that she can be baptized and receive the blessings from the Holy Ghost! On a different note, I am officially being eaten alive by mosquitoes. I've tried bug spray, but it doesn't work very well. The one I have right now has 15% deet. I'm thinking I may have to get one of those crazy concentrated repellents that has 90% deet or something. I have about 15 mosquito bites on my arms and legs right now and they itch like crazy!! Even if I don't scratch them, they still swell up pretty big. The mosquitoes here must have extra potent saliva or something. Other than that, we haven't seen too many bugs. 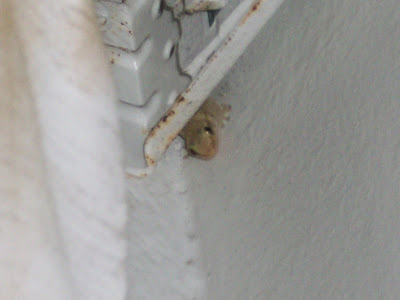 I did find a gecko living in our bedroom curtains the other day. It stuck it's head out long enough for me to take a picture, then hid. Monday was my companion's birthday. She turned 23. I made a pretty cool birthday poster that had lots of pink (her favorite color) and flowers (I was told that she's very girly). She loved it! The senior couples baked a cake for her, and some other sisters bought a big tub of ice cream. The Zone Leaders brought more cake, ice cream, and soda which was so thoughtful....until we discovered that they ate half of the cake and 1/3 of the ice cream. 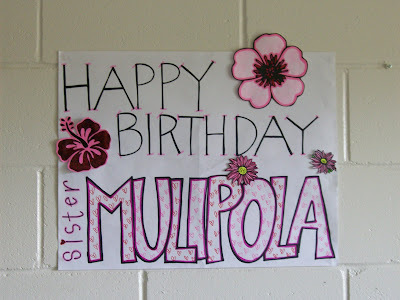 I guess some members gave it to them and after eating a bit, they thought they'd be so kind as to give the rest to Sister Mulipola for her birthday. Boys are so weird. The next day was Sister Hu's birthday. She is from Taiwan and super cute. I found out that she's sad because she NEVER receives letters. So I wondered if my fam and friends would be willing to send her some letters. It doesn't matter what they say, just as long as she has something positive to look at and has the chance to feel the joy of getting a letter in the mail! Her address is the same as mine, just address it to Sister Hu. (In case you forgot, my address is 1500 S Beretania St STE 416, Honolulu HI 96826-1937). Well I better go. We're going to the Polynesian Cultural Center for a couple hours today, so that'll be fun. I'll send more pictures next week! I love you all and miss you. Don't forget to email me back and write letters!